With over 37 million participants each year, running has never been more popular. Unfortunately, each year two-thirds of runners will experience an injury severe enough to disrupt their workouts. These injuries are not inevitable, but are the result of errors in technique and training. 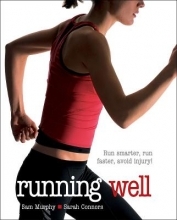 This is where Running Well comes to the rescue, providing the keys to maximizing performance while avoiding injuries. Complete with a full-color interior, the book allows runners at all levels to easily assess and improve technique. Runners can use the training tactics to enhance performance, increase conditioning with strength and plyometric workouts, avoid overtraining, and find tips on choosing the right footwear. Anatomical art supplements the thorough coverage of causes and symptoms of dozens of running injuries. Readers can pinpoint specific injuries by using a detailed flow chart that outlines symptoms and explains what to do for common problem areas, including the back, hips, knees, and feet.